NBC: Secretary of State Hillary Clinton said Arizona's new immigration law is an invitation to racial profiling. In an interview to air Sunday morning on NBC's Meet the Press, moderator David Gregory asked Secretary Clinton about some of the controversy. She stops short of saying the new law is illegal. "This law, which is clearly a result of the frustration that people in Arizona and their elected officials feel about the difficulty of enforcing the law along our border and preventing the continued immigration people who are not documented, but on the other hand, it is written so broadly that if you were visiting in Arizona and you had an accent, and you were a citizen from, you know, my state of New York, you could be subjected to the kind of inquiry that is call, that this law permits," Clinton said. "You think it invites profiling? Racial profiling?" Gregory said. "I don't think there's any doubt about that because clearly, you, as I understand the way the law is being explained, if you're a legal resident, you still have to carry papers," Clinton said. "Well, how, how is a law enforcement official supposed to know? So, again, we have to try to balance the very legitimate concerns that Americans, not just people in Arizona, but across the country have about safe and secure borders, about trying to have comprehensive immigration reform. With a law that, I think does what a state doesn't have the authority to do. Try to impose their own immigration law that is really the province of the federal government." "That's important," Gregory said. "Do you think this law will not stand up legally?" Sec. 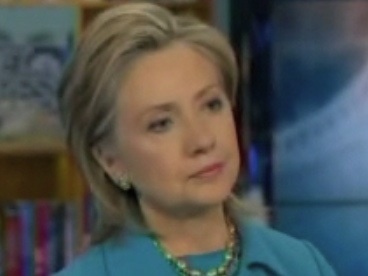 State Hillary Clinton: "Well, I don't want to offer a legal opinion. I, I think I'll leave that to the justice department, but I know the attorney general of Arizona has raised questions about the legality, and you're right, we have a visit from President Calderon coming up, a state visit. He's a very important partner to us on trying to stop illegal activity along our border. The importation of drugs, of arms, of human beings, all of the crime that, that's associated with, and we believe that he has really done the best he can, under very difficult circumstances, to get this under control. We don't want to make his life any harder either. We want to try to support him in what has been a courageous campaign against the drug traffickers."